How to Unlock Your Samsung Galaxy S6 and S6 Edge | OhGizmo! Below you will find everything you need to know about the most effective way to unlock your Samsung Galaxy S6 or S6 Edge, alongside all the advantages you’ll have after doing it. So, let’s start with the advantages shall we? 1. Most people want the freedom of using any carrier they want due to the various offers they receive. For example, if you find out that a new carrier has a cheaper monthly plan, with way more data included, why wouldn’t you switch to them? Not to mention that if all your friends and family are using a specific carrier, you want to use it too. In this case, unlocking the phone is the only solution. 2. Secondly, there are those roaming fees you want to avoid when traveling or even moving to a new country for a while. Yeah, we all hate them, as they’re ridiculously high some time. But you can avoid them by simply unlocking your Samsung Galaxy S6 or S6 Edge and use a local SIM card. 3. Finally, an unlocked phone is way easier to sell and you can get more money on it. You don’t know if a potential buyer is planning to use it in the same network as you did or a different one. No you know what advantages unlocking your phone brings, so let’s find out how it can be done, shall we? 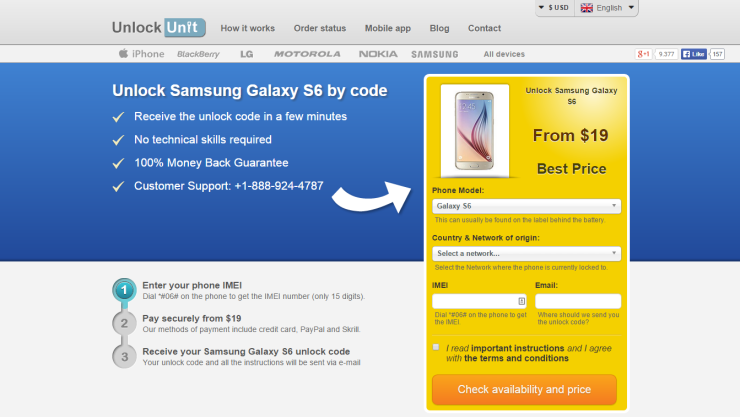 The safest and easiest way to unlock your Samsung Galaxy S6 or S6 Edge is by code. Online unlocking services, such as UnlockUnit.com or UnlockScope.com, can provide a code in just a few minutes, at great rates. 1. Complete the order form with a few details about your phone, like the IMEI and the name of the network and country you originally bought your phone from. Your email address is also needed, as this is how you will receive the code. After this, proceed to payment. 2. Shortly after, in a few minutes or hours, depending on the network your phone was locked on, you will receive the unlock code. 3. Insert a SIM card from an unaccepted network, other than the one your Samsung is currently locked on, and it will display the “SIM network unlock PIN” message, alongside a field where you need to input the code you just received. Once you’ve done this, your Samsung Galaxy S6 or S6 Edge will be unlocked and you’ll have the freedom to use it in any mobile network around the world. If you’re facing any difficulties with placing your order or the unlocking process, both website have an excellent support team, available 24/7, which will shortly resolve your issues. Also, here you can watch a short but detailed tutorial about how to unlock your Samsung Galaxy S6 or S6 Edge. Of course, we must mention that there are other methods of unlocking your phone, including rooting or asking your provider for a code, after your contract is done. Still, the first one is risky, while the latter can be be pretty costly. Therefore, unlocking your phone by code is the safest and easiest method you can use, as it can be done by anybody, with no technical knowledge required, at a very low price!